The Chicago blues is a form of blues music indigenous to Chicago, Illinois. Chicago blues is a type of urban blues. Urban blues evolved from classic blues following the Great Migration, or the Great Northern Drive, which was both forced and voluntary at times, of African-Americans from the southern United States to the industrial cities of the north, such as Chicago. Muddy Waters directly joined that migration, like many others, such as in Florida, avoiding the more harshly southern Jim Crow laws. Bruce Iglauer, founder of Alligator Records stated that, "Chicago blues is the music of the industrial city, and has an industrial sense about it." Additionally, recognizing the shift in blues, Chicago Blues singer and guitarist, Kevin Moore expressed the blues transition stating, "You have to put some new life into it, new blood, new perspectives. You can't keep talking about mules, workin' on the levee." Chicago blues was heavily influenced by Mississippi bluesman who traveled to Chicago in the early 1940s. The development of blues, up to Chicago blues, is arguably as follows: Country blues, to city blues, to urban blues". Chicago blues is based around the sound of the electric guitar and the harmonica, with the harmonica played through a PA system or guitar amplifier. Urban blues started in Chicago and St. Louis, as music created by part-time musicians playing as street musicians, at rent parties, and other events in the black community. For example, bottleneck guitarist Kokomo Arnold was a steelworker and had a moonshine business that was far more profitable than his music. One of the most important early incubators for Chicago blues was the open air-market on Maxwell Street, one of the largest open-air markets in the nation. Residents of the black community would frequent it to buy and sell just about anything. It was a natural location for blues musicians to perform, earn tips, and jam with other musicians. The standard path for blues musicians was to start out as street musicians and at house parties and eventually make their way to blues clubs. The first blues clubs in Chicago were mostly in predominantly black neighborhoods on the South Side, with a few in the smaller black neighborhoods on the West Side. New trends in technology, chaotic streets and bars adding drums to an electric mix, gave birth to a new club culture. One of the most famous was Ruby Lee Gatewood's Tavern, known by patrons as "The Gates". During the 1930s virtually every big-name artist played there. What drove the blues to international influence was the promotion of record companies such as Paramount Records, RCA Victor, and Columbia Records. Through such record companies Chicago blues became a commercial enterprise. The new style of music eventually reached Europe and the United Kingdom. In the 1960s, young British musicians were highly influenced by Chicago blues resulting in the British blues movement. Bluebird was an important Chicago blues label, notably due to the work of A&R/producer Lester Melrose, who created what is known as the "Bluebird Sound.". Many blues artists recorded for Bluebird, if only briefly, while Arthur Crudup, Lil Green and Tommy McClennan spent virtually their entire career with the label. Chess Records, run by brothers Leonard and Phil Chess, was probably the most famous of the Chicago record labels to feature or promote the blues. Musician and critic Cub Koda even described Chess Records as "America's greatest blues label." It was active from 1950–1969 when the brothers sold the company. Most solo artists also did double duty as session musicians on the records of others. Checker Records was a subsidiary of Chess that recorded Chicago blues musicians such as Bo Diddley, J. B. Lenoir, Robert Lockwood Jr. and Sonny Boy Williamson II. Cobra Records (together with its Artistic subsidiary) was an independent record label that operated from 1956 to 1959. The label was important for launching the recording careers of Chicago blues artists Otis Rush, Magic Sam, and Buddy Guy. It signaled the emergence of a distinctive West Side Sound. Cobra Records was started on Chicago's West Side in 1956 by Eli Toscano (a record store and television-repair shop owner). When his previous record label, Abco Records, created in early 1956 alongside Record man Joe brown, failed to generate much interest, Toscano approached Willie Dixon about working for Cobra. Dissatisfied with his arrangement with Chess Records, Dixon joined Cobra. There he served in many capacities, including talent scout, producer, arranger, songwriter, and bassist, as well as guiding its artistic vision. Delmark was formed when Bob Koester moved his Delmar label from St. Louis to Chicago in 1958 and remains active today. One of the only record companies to this day that has recorded nine-string blues. They are still known for jazz and blues. Delmark was known for its strong competition with Chess records during the early 50's. Artists recorded by the label include Roscoe Mitchell, Junior Wells, Robert Lockwood Jr. and Sonny Boy Williamson II. Bruce Iglauer, a former employee of Delmark, formed Alligator Records in 1971. Alligator Records remains a premier blues label to this day. They have recorded Chicago blues musicians such as Koko Taylor, Buddy Guy, Otis Rush, Hound Dog Taylor and Eddy "The Chief" Clearwater. Chicago blues was one of the most significant influences on modern rock music. Chuck Berry originally signed with Chess records—one of the most significant Chicago blues record labels. Berry met and was influenced by Muddy Waters in Chicago and Waters suggested he audition for Chess. Willie Dixon and other blues musicians played on some of Berry's early records. 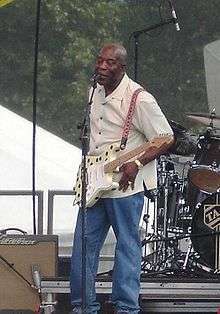 Although The Beatles were not significantly influenced by Chicago blues music, later British invasion bands and artists such as The Rolling Stones, The Yardbirds, The Jimi Hendrix Experience, Cream, and Rory Gallagher were all influenced by Chicago blues musicians such as Big Bill Broonzy, Willie Dixon, Muddy Waters, and Howlin' Wolf. ↑ William H. Frey, "The New Great Migration: Black Americans' Return to the South, 1965–2000", The Brookings Institution, May 2004, pp. 1–3, accessed 19 March 2008. ↑ Oakley, Giles (1976). The Devil's Music: A History of the Blues. New York: Taplinger. p. 177. ISBN 0800821890. ↑ Rowe, Mike (1973). Chicago Blues: The City and the Music. London: Da Capo Press. pp. 40–49. ISBN 0-306-80145-0. ↑ Oakley, Giles (1976). The Devil's Music: A History of the Blues. New York: Taplinger. p. 172. ISBN 0800821890. 1 2 3 Gilliland, John (1969). "Show 4 - The Tribal Drum: The rise of rhythm and blues. [Part 2]" (audio). Pop Chronicles. Digital.library.unt.edu. ↑ Kerzner, Barry (2013-06-06). "James Cotton's "Cotton Mouth Man" Delivers". Chicagoblues.com. Retrieved 2014-05-18. ↑ "Chicago Blues – Artists". AllMusic. Retrieved 26 October 2013. ↑ "Bluebird Records | Big Road Blues". Sundayblues.org. Retrieved 2012-12-10. ↑ Rowe, Mike (1873). Chicago Blues the City and the Music. London: Da Capo Press. p. 126. ISBN 0-306-80145-0. ↑ Sandra, Pointer-Jones. "Delmark Records History". Blues Revue Quarterly. Retrieved 27 October 2013. ↑ Connaughton, Marcus (2012). Rory Gallagher His Life and Times. The Collins Press. ISBN 9781848891531. ↑ Inaba, Mitsutoshi. Willie Dixon's Work on the Blues: From the Early Recordings through the Chess and Cobra Years, 1940--1971. Diss. University of Oregon, 2005. N.p. : UMI, 2005. Print. ↑ Foundation for Research in the Afro-American Creative Arts. “Muddy (né McKinley Morganfield) Waters.” The Black Perspective in Music Vol. 11. No. 2 (1983): 230-31. Print. ↑ “Howlin’ Wolf.” Encyclopedia of Popular Music. 4th ed. 2006. Print. Keil, Charles (1991) . Urban Blues. Chicago, IL: University of Chicago Press. pp. 255 + ix + 8pp of plates. ISBN 0-226-42960-1. Oakley, Giles (1976). The Devil's Music: a History of the Blues. London: BBC. p. 287. ISBN 0-563-16012-8.